Gripeez is an amazing new product that has made it quick and easy to mount any object without using nails or other adhesives that do serious damage to walls and other surfaces. Gripeez will hang and hold objects anywhere in just a matter of seconds. You simply peel, stick, and hang and the object holds steady until you are ready to remove. The Gripeez Hanging Pads are also reusable. Simply rinse and they are ready to use again – up to 1,000 times! Cannot hold very heavy objects. I found some of my heavier paintings would begin to slip after a certain time. However, this was a very rare occurrence and almost everything I tried to hang stayed in place just fine. Gripeez Hanging Pads are quite similar to other products that are available to hang things around the house. The main difference between Gripeez and the competition is that Gripeez works on any surface! With Gripeez, you can hang objects on any suface, including wood, tile, brick, and many more. This difference makes Gripeez more versatile. When you are choosing which to buy, this should be a big consideration. 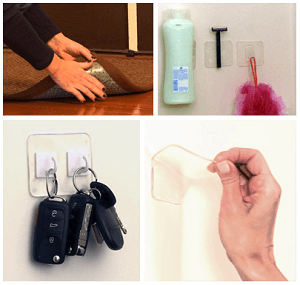 To use Gripeez, you will simply peel off the back, stick it on the surface of what you want to hang, and then press it to the wall or area where you want the item to hang. You can utilize these for many other uses than hangings things on the wall too! If you have a rug that you do not want to move, put one on the back and it will stay in place. You can also use it to hang your remotes or controllers on your table or television stand. Or use Gripeez to keep your toothbrush holder in place or in the car to hold up your tablet. The possibilities are endless. I saw Gripeez while I was watching TV one day. I was interested enough to go online and look at the site, and thought that they’d be pretty handy to have around the house. Well, I was right. These work great. Gripeez Hanging Pads stay put and when you are ready to remove there is no damage to your walls. I bought these for my daughter in her college apartment this year and they worked perfectly. She had to move things around many times and was able to do so without any damage. We found that Gripeez works best if you cut them into fours and stick them in each corner of the object. I remember last year she had a picture that kept falling down on her while she was sleeping. But, with Gripeez she doesn’t have a problem anymore. Everything stays in place and looks great! I’d definitely recommend Gripeez Hanging Pads to a friend, especially since they are so inexpensive. They would make great housewarming gifts. Gripeez is also reusable over 1000 times! Simply rinse, dry, and re-grip. The secret is the powerful ultra-tight double-sided grip that never slips. Those one and done velcro strips are a hassle to install, never hold their grip, and when you remove it, you have to throw it away. Gripeez makes it easy to go from bare walls to finished home in just minutes. It’s great for apartments and dorm rooms, where you can’t use nails, to turn your mess into an organized workplace. With Gripeez you can hang anything anywhere without a care! Turn the back of the seat in front of you into a media center, use it to hold your EZ Pass, even the GPS will stay in place. To release an object, just twist and remove with no sticky residue. Need to decorate for the holidays? Or have a party in a jiffy? Get Gripeez! Gripeez works on metal and tile to keeps things handy, and sticks on wood and glass like nothing else can. Keep all your remotes handy to create more table space, or use it to keep that door mat in place. Now you can forget those once and done hooks. Gripeez works where nothing else can!